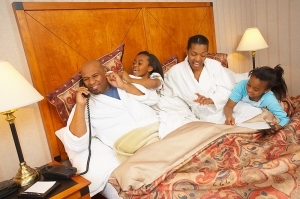 Home » Articles » Stressed About Vacationing? Apps and tips for easy travel. Getaways shouldn’t be stressful. Of course with an entire family to be concerned about in a place other than home, going places can frazzle even the calmest parent. Stay cool and collected wherever you’re headed this summer (and beyond), by expecting the unexpected and over-preparing. Throw in the following apps and tips, and not only should the trip go smoothly, but you’ll be apt to handle emergency situations should they arise. Even better, almost all of this preparation is free and may be done before you depart. No one wants the hectic mess of running through the airport from being late. And rarely does anyone enjoy the opposite: waiting for hours from being uniformed about a delayed flight. With GateGuru, you can track flight delays and changes, as well as find food, ground transportation locations, Wi-Fi zones, gate numbers, restrooms and other necessities all with the ease of your smartphone. According to the National Center for Missing & Exploited Children, on average, 2,185 children are reported missing each day. Have you ever thought of what steps to take should your child go missing in busy vacation spots like Disneyworld, Times Square or even the local beach? EmergencyLink, available for the iPhone, Android and Blackberry, has a free service where you can store your child’s information and instantly create a missing person’s report that may be directly sent to police or medical professionals if your child goes missing. Many of us take the proper precautions to stay as healthy as possible right before traveling— no one wants to be sick on vacation. But have you checked the local health information for the destination to which you are traveling? The Centers for Disease Control and Prevention has a user-friendly map at wwwnc.cdc.gov/travel. Click on “Destinations” to scroll down an A-Z list of countries. Select a destination to obtain important health information before traveling to keep the entire clan in tip-top shape. There is no doubt that our nation has some monumental sites worth seeing, such as the Grand Canyon, Golden Gate Bridge and Mount Rushmore. If you decide to visit these landmarks and other popular spots, be on the lookout for deals rather than getting scammed by tourist traps. With the following apps in your arsenal, you’ll also be prepared for unexpected stops. Hotel Tonight is a fantastic app for the iPhone, iPad and Android that finds last-minute deals on a variety of unsold rooms with discounts up to 70 percent off. Another great website/app to check out is Gas Buddy, which locates the nearest gas station with the lowest prices. Michael Soenen is the chairman and CEO of EmergencyLink, a free 24-hour emergency response network that allows you to create an emergency plan that may be shared with family and friends. EmergencyLink’s 24-hour emergency response center executes your plan in an emergency. Visit www.emergencylink.com to sign up for a free account or follow the company on Twitter @EmergencyLink.